When the Leafs or Blue Jays play a home game, Doug Tuira doesn’t watch to see if Auston Matthews will score an overtime winner or Roberto Osuna will close out the ninth inning. The Metrolinx Control Centre manager instead keeps an eye on the events so that he knows when they end, because that’s when the real game begins for Toronto-area transit agencies. 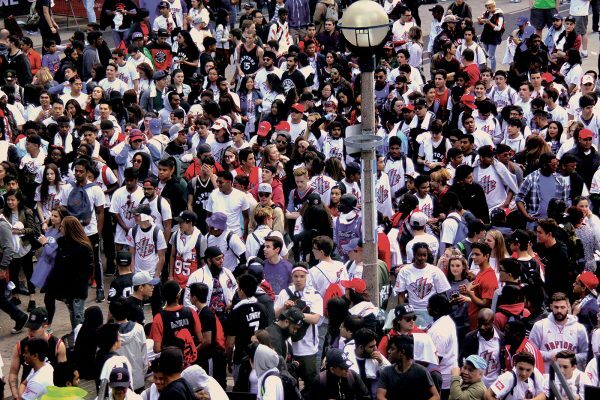 Whether it’s a Blue Jays, Leafs, Raptors, or Toronto FC game, tens of thousands of fans need to get home at the same time. Lots of them take transit — compared to other North American cities — there are very few parking lots around Toronto stadiums, and the Air Canada Centre and Rogers Centre enjoy perfect transit scores of 100. Moving all those people in an orderly manner is a challenge, and that’s where Tuira comes in. Although the Blue Jays can draw the biggest crowds, up to 50,000 for sellouts, they aren’t the biggest challenge on a consistent basis. That distinction belongs to TFC, says Tuira, who happens to hold season tickets to the team’s home games. “We have a lot of crowding with TFC,” he says, adding that from a ridership perspective it’s comparable to a Blue Jays game. Emily Assuncao, the TTC manager for closures and diversions, agrees that moving TFC fans is especially difficult, but she notes a different reason. “The fans are different,” she says. Beyond the temperament of the fans, Tuira says the transit infrastructure at Exhibition Place isn’t as elaborate as Union Station, which makes it more challenging to get almost 30,000 spectators home. “There’s only one real exit out,” he says of the Exhibition GO station tunnel, which can take up to 20 minutes to traverse after games. Metrolinx is working on a solution, which could involve widening the at-capacity tunnel, but that’s a long-term project. In the meantime, the challenge is to ensure fans exit in an orderly, safe, and speedy fashion. That’s not an easy task, but there’s a few tricks transit agencies rely on to accomplish the goal. The first is to provide more frequent service around the time that games end. That means GO trains leave every 15 minutes instead of every 30 minutes. The TTC doesn’t do the same for games at the Air Canada Centre — the Yonge-University-Spadina line is already at capacity — but they add vehicles to serve TFC’s BMO Field when necessary. For other events, like Toronto’s many marathons, Metrolinx says it adds about 10 buses to help meet demand. These are easier to manage, Tuira said, because runners cross the finish line at various times, meaning that there’s not a crush of would-be transit riders all at once. For the same reason, Tuira says it’s actually easier to manage the post-TFC crowd during the CNE, because lots of fans stay at the site to ride Ferris wheels, watch SuperDogs, and whack moles, leaving in waves. But for the most part, pro sports games tend to have their fans leave all at once, creating big challenges. It’s especially true after weekday sports games, when fans are more likely to go home right away rather than grabbing a drink with friends. Weekday Blue Jay sellouts are the worst for post-game transit planning, said Tuira. When fans go home all at once, they can outnumber platform capacity, which creates a safety issue. To help alleviate this problem, GO lines up multiple trains at the predicted finish time for the game, so that one is always available after the next. As soon as one train leaves, the next one arrives and opens its doors as soon as possible. This has the effect of turning the train into a “floating platform” as fans fill the vehicle seats rather than waiting in limited platform space. Despite these challenges, the Metrolinx employee says crowd control can be easier to manage at sporting events compared to major concerts. Although the City levies fines when shows go beyond permitted times, pop stars and rock stars tend to thumb their nose at licensing and standards bylaws, an attitude that makes for better shows but tougher to schedule transit service. Aged rockers Guns N’ Roses was a recent culprit, he says. Assuncao says that planning for events plays an important part in smooth transit delivery. She explains that the TTC has monthly meetings with various groups — Toronto Police Services and City Planning among them — to discuss upcoming challenges. That includes run-of-the mill pro games, one-off events like the Invictus Games that took place in fall 2017, and the annual Honda Indy. “As soon as an annual event is done we debrief,” she says, saying that the transit agency wants to immediately find out what worked and what didn’t. Tuira says that the Pan Am Games in 2016 was an especially big job, and planning began over a year in advance. But it had a significant legacy in that it improved the agency’s capacity to address transit crowding after games. “From a preparation perspective there was an expectation that we had to step up our game,” says Tuira. The TTC also plans for certain contingencies. They know what to do when or if TFC, which led the league in the regular season, wins the championship. And while they don’t have special plans for the World Cup, there’s a protocol if a team with enthusiastic local support reaches the finals and triumphs. If, say, Portugal wins the coveted World Cup in the summer of 2018, then Little Portugal in the west end will see streetcar diversions for as long as revellers feel the need to express their passion. Asked about the ultimate Toronto sports event, and what planning exists for it — because it will definitely happen, right? — Tuira laughs.